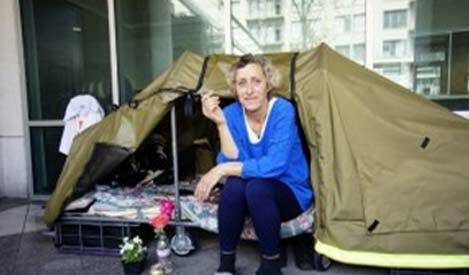 a safe place to sleep at night for those who are resistant to the idea of shelters. The Courtyard Outreach Program is a unique form of outreach for the Skid Row community. Our outdoor courtyard is open to anyone during the day and is a safe place to sleep in at night for those who are resistant to the idea of shelters. The overarching program helps break the cycle of homelessness by identifying the most vulnerable individuals in our courtyard and creating a bridge to our life-saving services. Our courtyard is a safe, monitored outdoor space specifically for homeless individuals. This overarching program helps break the cycle of homelessness by identifying the most vulnerable individuals in our courtyard and creating a bridge to our life-saving services. Our courtyard is a safe, monitored outdoor space specifically for homeless individuals. Most of us have had to use a porta-potty or public restroom at some point and know that the experience is far from pleasant. Imagine being homeless, and never having any other option. Worse yet, imagine having little or no access to any restroom at all. Thanks to generous funding from LAHSA’s Operation Healthy Streets, TMM operates a Courtyard Hygiene Center for the Skid Row community. Our community now has safe, clean and dignified restrooms which are a welcome change from other options, including the streets of Skid Row. Did you know that TMM offers the only permanent, 24/7 restrooms to the thousands of people living in Skid Row? There are very few restrooms available within the Skid Row area, all of which are either porta-potties, closed at night or are only available during certain hours of the day. One of the greatest indignities of being homeless is not being able to use a clean and safe restroom when you need one. At TMM, we restore dignity to those in need by creating a safe environment of easily accessible clean restrooms. This is the day… to restore dignity.